Tantra workshops are for singles and couples who wish to immerse themselves deeper into the tantric art-of-living and integrate it in their everyday life. When love, sexuality and consciousness connect, it opens you up to new perspectives of growing in your relationships and living your sexuality in a fulfilling way. Tantric sexuality is the creative potential of divinity. Refined sexual experiences touch our innermost core and connect us with a higher consciousness, and meditation. 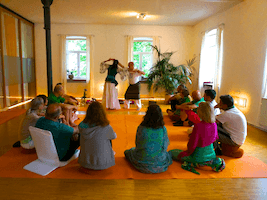 There are workshops for beginners and tantra-experienced participants. It is best to follow your intuition, and if in doubt we will be pleased to advise you on the selection. Tantric love in the Circle of Light rising from the connection of male and female energies. The ecstatic essence of the Tantric vision awakens when you allow yourself to invite the unknown into your relationships. By connecting the harmony of your open heart with the aliveness of your sensuality, the separation of heart and sexuality will dissolve. Female and male energies will enrich each other. In this process, you learn to consciously perceive energies and to let them circulate together with a partner in the tantric Circle of Light. You begin to immerse yourself in the secrets of feminine and masculine energies. In Orgasmic Meditation, you experience a new sensitivity and discover an aliveness that comes from relaxation. In unexplored spaces, you experience true intimacy with yourself and others – and even with the whole existence. In an environment of trust you discover your unique, sensitive-sensual beauty. Refine your body awareness and discover the magic of your sensuality. Sensuality awakens in a loving space of trust, in which you are recognised and respected with your sensitivity, limitations and longings. Therefore you feel safe enough to open your body for attentive touch in a new, wholesome way . In sensual encounters, you allow yourself to touch and to be touched. You recognise the condemnations about your body and how they repress the aliveness of your energy, and you start to accept the uniqueness of your beauty. By connecting your sensitivity and sensuality, you get into contact with your deepest longings and accept the invitation to open, merge and let go. Resolve the vicious circle of hope and frustration through Tantric consciousness. Being true and open to what wants to to happen in every moment is a way to experience something about real love and intimacy. Usually, you encounter your partner burdened by positive or negative past experiences. The dream of a happy partnership sooner or later turns into a nightmare. Often you are driven by a yearning to merge, but lacking right understanding about the dynamic in relationships, you tend to move in a vicious cycle of hope and frustration. You will get to know various essential keys that will help you to rekindle the fire of love through Tantric consciousness. This workshop is especially suitable for couples who explicitly want to practice with their own partner. The exercises mainly take place in two-constellations and you decide whether you practice with your partner or change partners during the different exercises. A Tantric Chakra journey from sexuality to the heart and to meditation to meet your Buddha-nature. We will explore each of these seven energy centres through deep experiences. You get an understanding of how the energies of the chakras manifest in your life issues: in your physical presence, intimacy, strength, love, communication, intuition and silence. As you unfold, harmonise and balance these energies, your life becomes more spontaneous and intensifies. You can allow the energy to rise through all the chakras from your sexuality to the heart – and into meditation. Your life will be a beautiful challenging adventure from moment to moment. Connecting others from this space you can allow yourself to celebrate the mystery that you are. It will give you a taste of adventure, joy, and your buddha-nature. Are your inner man and your inner woman supporting or fighting each other? Life is a balance between male and female aspects. This workshop offers significant and amazing experiences about what it means to fully accept one’s own masculinity and femininity. You look at how your masculine and feminine parts relate to each other: whether one denies the other side or tries to dominate or manipulate – or if they are supporting each other. The inner female aspect of the man complements his male qualities and gives him inspiration, creativity and sensitivity. The woman’s femininity is completed by the masculine aspect, which gives her clarity, straightforwardness and the ability to discriminate. Only when you acknowledge both sides, can a sense of inner oneness arise. Play with your senses and gain fulfilling sensuality in your relationships. Discover the playfulness of your senses as a path to fulfilling sensuality. This profound, sensual workshop will help you to meet others in the magic of the moment and to transform yourself into a compassionate, joyful person. In the safe space of wonderful rituals, you have the possibility to sensitively explore yourself with all your senses. Discover in a playful way what you need and who you are. In this workshop, you can engage again in deep feelings with people. It is a lovingly accompanied process of learning to recognize and let go of habitual patterns of attachment and resistance. You reconnect with your essential aliveness in relationships. Sensuality gives you a magnetic presence and the joy of savoring the moment in all its dimensions. Experience New Year as a sensual journey to your inner truth. Use the energy of the New Year to recognise outdated habits, and ritually throw old patterns into the fire to let them go, creating space for new, powerful visions. By feeling the longing of your heart, you expand your own boundaries and open yourself up to new adventures in love. 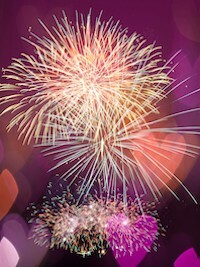 As a highlight, we will symbolically unite the male and female energies in a Tantric ritual, welcoming the New Year.